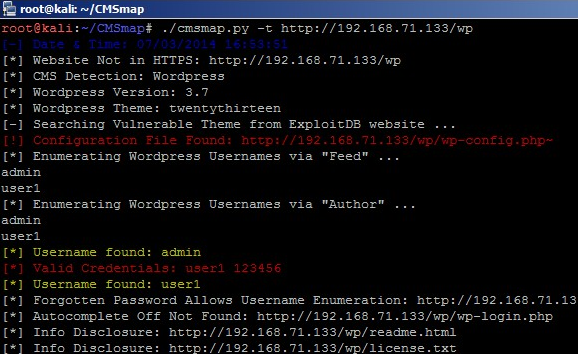 CMSmap is a free opensource CMS scanner that automates detection of security flaws in the most popular CMSs. The objective and purpose of CMSmap is to integrate common vulnerabilities for different types of CMSs in a single tool that is simple to use. Currently, CMSs supported by CMSmap are WordPress, Joomla and Drupal. CMSmap has been integrated into Kali Linux due to its popularity we have made it available online as well. CMSmap Online has been integrated into our free penetration testing tools online. CMSMap Online shown above using the Kali Linux distro has now been integrated into our penetration testing tools online portal. Check it out for free! You may also be interested in our professional penetration testing services.